Two dozen student activists crashed an alumni event at Duke University on Saturday, using a megaphone to make their demands and drown out the speaker, Duke President Vincent Price. 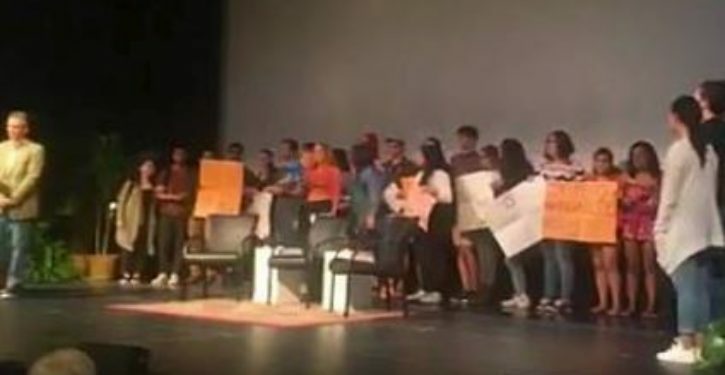 The students were surprised to discover that their interruption had irritated many alumni in the audience, some of whom heckled the activists and turned their backs while the demands were read. Now Duke’s administration is considering whether to discipline the students, whose behavior unquestionably violates university policy. That doesn’t sit well with them: Protest leader Gino Nuzzolillo accused administrators of aggravating the mental health problems of student activists. The administration’s letters informing students that they are under investigation have had the effect of “exacerbating any pre-existing mental health conditions,” Nuzzolillo toldThe Duke Chronicle.